I recently had this mounted on a desk easel panel for Grampy to have at work. I will show you the other one next week. This memory was posted in Wordless Wednesday and tagged Grampy, rolling, Wordless Wednesday on June 26, 2013 by Grandma Kc. I had forgotten how much rolling in the grass makes you itch. Entirely worth it. Look at that effort!! Look at that grin!!! What a fun Grampy. I’m sure Amara was giggling up a storm. It’s this kind of thing that makes me wish we had grass again. We have not a blade in our yard (except for the few strongholds who pop up now and again amongst the boulders and such). Great fun and great photos! Haha, sweet memory, Happy WW! Go Grampy! These pictures make me want to get on the ground and do the same thing. 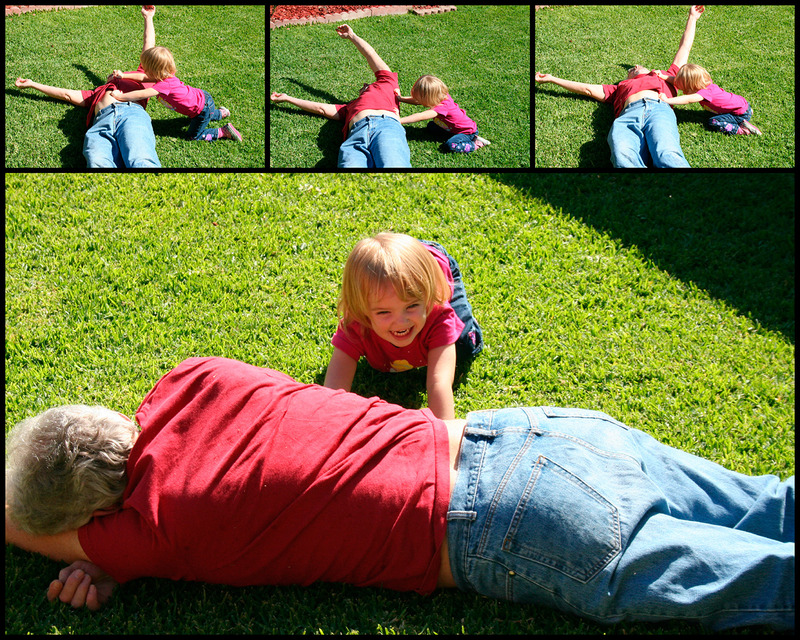 How much more fun to have a cute little granddaughter giving you the initial push you need to get rolling! You can really see from this picture why the two of them have always been so close – from the very beginning he has gotten down on the ground to play with her. I’ve never really known who got more out of it – him or her! He is good Grampy! Great series of photos. Fun! This post makes me even more excited to see my grandson in a few weeks….what a doll baby you have in her.